"Everything on earth is soon forgotten," Napoleon said, "except the opinion we leave imprinted on history." 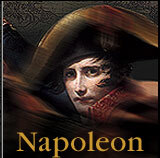 In 1823, two years after his death, the publication of Napoleons memoirs sent shockwaves through French society. He reinterpreted his decisions and re-fought his battles for all the world to admire. Longing for the glories he presented and moved by his heroic martyrdom, Napoleon was able to stir public opinion against the restored King Louis XVIII from beyond the grave. JOURQUIN: He reconstructs his actions to justify his choices, to say that he was the savior of the revolution, to say that he wanted peace, to say that he wanted a new world and that the kings of Europe were opposed to a modern man, a man of action who was working for the good of the people. What is conveyed in this is an individual who can accomplish so much, so very much through determination and energy and intelligence. This is his sense of himself. On St. Helena, Napoleon had dictated specific instructions to his young son Napoleon II. Although he had named his son as his successor when he abdicated, there was no real hope of Napoleon II gaining the throne legitimately. Pictures of Napoleon II, who had been raised in the Austrian royal court, adorned the wall of many peasant households. 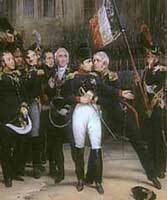 But hopes for the return of Napoleon II to France were dashed when he died of tuberculosis at age twenty-one in 1832. By 1848, the ideals embodied in the French Revolution  and codified in Napoleons Civil Code  spread through Europe once again. Revolutions broke out in Prussia, Austria, Germany and Italy, as well as in France, as citizens demanded greater rights. Prince Louis Napoleon Bonaparte, son of Napoleons brother Louis and Josephines daughter Hortense de Beauharnais, capitalized on his family name to take control of the French government and proclaim himself emperor Napoleon III. He reigned until 1870, when a costly defeat by the Prussians forced him from the throne. Today, many of the current legal structures of nations that defied Napoleon are based on the concepts of his Civil Code. 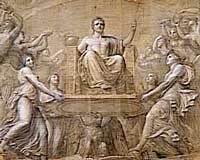 Considered to be his greatest legacy, Napoleons Civil Code assured the spread of the ideals of the French Revolution long after the end of his rule. But, it was through the image he presented of himself that the people of Europe found a symbol of revolutionary change. "There is no immortality," Napoleon said, "but the memory that is left in the minds of men."